The R62 was BMW’s first 750cc touring motorcycle (engine type M56), produced for only two years (1928/9), with a total of 4355 machines built. The R62 was designed and built in concert with its smaller brother the 500cc R52, which used the same chassis, and identical engine and gearbox castings. The increased engine capacity was gained using a different crankshaft and of course a different cylinder barrel and head casting. Thus the rider of with 750cc engine benefitted from a better power/weight ratio, and significantly better torque and top speed (a little over 70mph from its 18hp). The bent-tube frame was light and strong, although it was superseded almost immediately by the pressed-steel chassis of the R11 in 1929, and for a while both the R11 and R62 were available – their engines and gearboxes were identical, but the pressed-steed frame certainly looked more modern. Throughout their early years, BMW developed, improved, and introduced innovative new models on a yearly basis – the R62 arrived after only 5 years’ total motorcycle production from the Munich factory, and was vastly improved from their first model, the R32 of 1923, having well over twice the horsepower and a far more modern engine than the original. 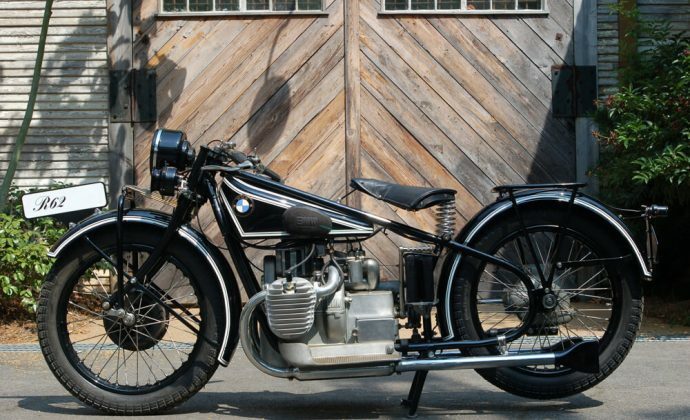 For lovers of antique motorcycles, the early ‘flat tank’ BMWs have a charm all their own, being visually much lighter than the flat-metal frames which replaced them. They’re also robust enough to tackle the Motorcycle Cannonball cross-country endurance run with success, and have a rabid global following, which includes excellent parts backup. Flat-tank BMWs with 750cc engines are in the high demand, as they’re suitable for modern road conditions, for those rare riders who enjoy the unique thrill of riding a coveted antique down the highway. 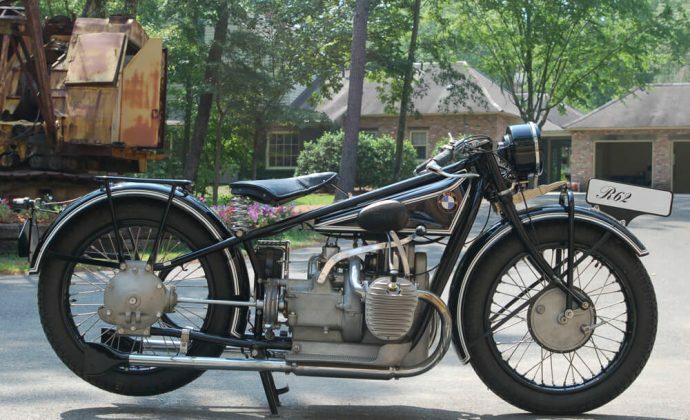 This 1929 BMW R62, frame #26837 and engine #60656, is fully restored and in excellent running condition. Originally from The Willy Neukens Collection of Important BMW Motorcycles.